Cream the Stork Bake, add the sugar, a little at a time. and beat until light and creamy. Add the almond essence. Beat the eggs well and stir into the Stork Bake mixture. Mix until smooth. Sift the dry ingredients together, then add alternately with the milk to the Stork Bake mixture. Mix carefully and thoroughly. Turn the batter into a greased Easter egg pan (available for hire from specialist baking shops) and bake at 180ÂºC for 20 â 25 minutes. Cream the Stork Bake until it lightens in colour. Add the icing sugar a little at a time until it is all creamed in. Add the vanilla essence and a little milk to make it a smooth consistency. Sandwich the two half eggs together and place on a silver board or plate. Add food colouring to the remaining icing. Use a nozzle and piping bag to pipe some of the stripes. Use a small plastic bag filled with a little icing. Push it into one corner to make a disposable piping bag. Snip the end with sharp scissors. You can pipe squiggles as well as lines or dots. Decorate with sweets or icing novelties. 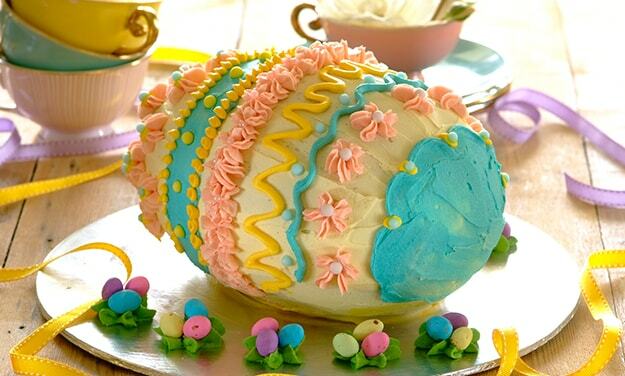 Decorate around the egg with mini eggs.